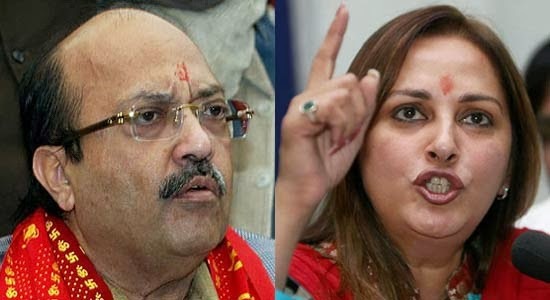 Amar Singh and Jaya Prada joins Choudhary Ajit Singh's Rashtriya Lok Dal (RLD) Pary today in Uttar Pradesh. Former Samajwadi Party leader Amar Singh has said that he believe in ideology of Choudhary Charan singh and decided to join the Rashtriya Lok Dal (RLD). His announcement came after the Congress reportedly told him to contest as an independent candidate. The RLD is fighting the 2014 General Elections along with the Congress. It will contest from eight seats in Uttar Pradesh: Baghpat, Kairana, Bijnor, Nagina, Amroha, Hathras, Mathura and Bulandshahr.